If you're like me, your computer is filled with a hodgepodge collection of documents in many, many formats - Word files, PDF files, a bunch of spreadsheets that go back for years. It can be a real bear when it comes time to do some research - you have to open each and every file to read through it, seeing if it's got any relevant information. Open this file, close that file, open Word, open Adobe, rinse, repeat. File Search Assistant rescues you from this monotony by providing you with a way to perform text searches across a variety of different file formats, including Adobe Acrobat (PDF) documents, Microsoft Office files (xls, doc), even ZIP archive files. Even better, you don't even have to launch any application other than File Search Assistant to view the contents of these files - a handy preview pane lets you peek inside each document without having to open it! If you'd like, File Search Assistant can generate an HTML search report that lists your search term and other file selection criteria, along with the results of your search. For each hit, the report provides a path to the file, a link to open the file, and the text fragment that was found in the file. Advanced features bring File Search Assistant to the next level. 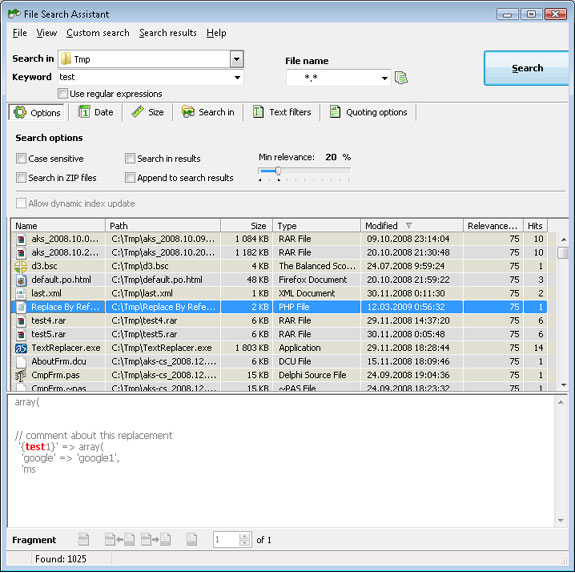 You can perform searches within your search results, search network drives, use file extension masks to limit your search to specific types of files, and search by date and file size. You can even copy and paste files that show up in your results to a different folder location! Perform text searches across Adobe Acrobat (PDF) documents, Microsoft Office files (xls, doc), and even ZIP archive files! Save yourself the hassle of launching applications just to view the contents of a file. Use filters to limit your search to specific file types or folders. View a report summarizing the results of your searches.